According to a news article from 20 April, scientists investigating NW Rota-1 during the previous two weeks observed the volcano erupting about 520 m below the ocean's surface. Measurements indicated that the volcano had grown about 40 m since 2006. One scientist observed billowing yellow and white sulfur clouds, carbon dioxide bubbles streaming out of the vent, and "ash and pebble-sized rocks raining out of the plume." William Chadwick of the U.S. National Oceanographic and Atmospheric Agency (NOAA) sent us a draft abstract of a research paper (Chadwick and others, 2010a) concerning recent observations on the volcano named NW Rota-1 in the Mariana Islands (figure 7). The abstract was submitted to the American Geophysical Union (AGU) in 2010 for presentation at a future meeting. Chadwick noted that NW Rota-1 appears to have been continuously active since first visited by NOAA scientists in 2003 (BGVN 29:03), and definitely between February 2008 and March 2010 while it was monitored with a continuously recording moored hydrophone (BGVN 33:02 and 34:06). A detailed report of the 16-30 March 2010 expedition appears at the VENTS Program website (Chadwick and others, 2010b). Figure 7. Broad-scale map showing part of the Northern Mariana Islands and vicinity (an area roughly midway between the main island of New Guinea on the S, and Tokyo, Japan on the N). The islands shown include Guam, Rota, Saipan, and others. The map emphasizes the location of the active submarine volcano NW Rota-1 and the currently quiet submarine caldera West Rota. After Embley and others, 2004; courtesy of the American Geophysical Union. Chadwick and others (2010a and 2010b) described the March 2010 expedition aboard the research vessel RV Kilo Moana and deploying the remotely operated vehicle (ROV) Jason. The expedition found the submarine volcano was still erupting more or less continuously, as has been observed since 2004. In addition, the expedition discovered that a major zone of submarine mass wasting (a "seaslide" ? hereafter, slide, figure 8). The slide had occurred since the last visit in April 2009 and the available on-site hydrophone record suggested it could have taken place around 14 August 2009 amid a 3-day eruptive episode. The ROV Jason dive observations revealed the responses of the volcano's magmatic and hydrothermal systems to such a collapse, as well as how the resident chemosynthetic biological community has responded to the event. Figure 8. At NW Rota-1, the approximate trace of the headscarp (bold line) for a large submarine slide discovered when visited in March 2010. Only one of the four hydrophones were found, the one located farthest N. The others were presumably destroyed during the slide, which sent material to the SW from the headscarp area. Note the reentrant near the center of the mapped headscarp. This zone is where the high-temperature vents were found (see next figure). "RAS 500-m mooring" refers to a remote access sampler that took samples at timed intervals at a hydrothermal vent. That device was lost due to the slide. Taken from Chadwick and others (2010b). The morphological changes from the slide were quantified by comparing multibeam bathymetric surveys between 2009 and 2010. Compared to the former summit ridge, the slide's headscarp in 2010 stood ~ 100 m farther N and in this upslope region depths changed by up to 90 m. The slide excavated material from the upper S slope to a distance of 3.5 km downslope, and deposited material 2-8 km from the summit down to at least a depth of 2,800 m on the flank. The area and volume of slide deposits (positive depth changes) were 7.1 x 106 m2 (~ 7 km2) and 5.3 x 107 m3, respectively, and the maximum thickness was +42 m. The area and volume of material removed by the slide (negative depth changes) were 2.2 x 106 m2 and -4.1 x 107 m3, respectively. The changes in morphology near the summit show that the slide primarily removed loose volcaniclastic deposits that had accumulated near the active eruptive vent, exposing an underlying stock-like core of resistant intrusive rocks and massive lavas at the summit. In preliminary investigations, scientists found no evidence for a local tsunami generated by the slide. For example, a scan of mid-August tide-gage data on the W side of Guam (Aprons Harbor) did not show compelling evidence for a tsunami. Jason dives found that most of the hydrothermal vent sites visited in 2009 had been wiped out, but a few survived, and new ones had formed. The lava cone that had grown at Brimstone vent last year was completely gone in March 2010. Brimstone vent was ~ 25 m deeper than last year when its depth was ~ 555 m, but about in the same location. Its hydrothermal was comparatively quiet compared to last year. However, the 2010 expedition found at least four other (deeper) eruptive or hydrothermal vents adjacent to Brimstone in an E-W line (figure 9). The eruptive activity was variable, with individual vents turning on and off daily or even hourly. Some eruptions were documented (eg., figure 10) and vent areas were sampled. Figure 9. High-temperature vents seen in 2010. Bold decorated line indicates the approximate location of the slide's headscarp, along which material to the S was translated to the SW, thus potentially affecting these vents. To facilitate navigation and aid in quantifying changes, the 2009 crew left occasional survey markers on the seafloor in this region. When dived on in 2010, the slide had removed 10 of these markers, venting had damaged or destroyed two markers, and three remained intact. Taken from Chadwick and others (2010b). Figure 10. During the 2010 expedition, ROV Jason captured this eruption at Styx vent (depth, ~ 560 m). Original caption was "Large eruption at Styx Vent with tephra, gas bubbles, and extensive plume [27 March 2010 at 0428, on dive J-494]." Logs from around this time described several eruption plumes; observations also included submarine plumes with bifurcating cells. Taken from Chadwick and others (2010b). During March 2010, there were at least five vents displaying eruptive or high-temperature behavior (or both, including Phantom, Sulfur, Brimstone, Styx, and Charon) along a 200-m-long line (figure 9). The biological community at NW Rota-1 previously included two species of shrimp in about equal numbers. However, after the slide, the Alvinocaris shrimp species was almost gone, whereas the Opaepele loihi shrimp were present in the thousands. A hydrophone mooring deployed ~ 150 m W of the summit survived and recorded the sounds of eruptive activity since February 2009. In addition, one monitoring instrument was moved 1 km downslope and buried by the slide, and two others were destroyed. The surviving hydrophone provides critical data on the time of the slide. The loss of the other recorders gave scientists a more limited view of the volcano's behavior, but the scale of the slide was also much larger than they thought possible and is perhaps the largest submarine slide yet monitored at close range. The report noted "the moored hydrophone that we recovered[, which] had been recording since February 2009, shows that the landslide probably occurred on 14 August 2009, apparently in the middle of an intense eruptive episode that lasted more than 3 full days." The associated acoustical signals were the largest during the two-year period of monitoring. After months of continuous, short duration (~ 1 minute) explosions, the slide seemingly occurred within a 5-6 hour period on 14 August. The signals suggested that an intense, continuous eruption triggered the slide. Inspection also revealed impact to the surviving hydrophone's mooring. References. Chadwick, Jr., W.W., Dziak, R.P., Embley, R.W., Tunnicliffe, V., Sherrin, J., Cashman, K.V., and Deardorff, N., 2010a, Submarine landslide triggered by eruption recorded by in-situ hydrophone at NW Rota-1 submarine volcano, Mariana Arc: draft abstract submitted to American Geophysical Union. Chadwick, W., Wehmeyer, B., Heintz, M., and Bobbitt, A., 2010b, NW Rota-1 2010 cruise report: R/V Kilo Moana, cruise KM-1005, March 16-30, 2010, Guam-Guam (JASON Dives J2-486 to J2-495): NOAA Vents Program, 293 p. (URL: http://www.pmel.noaa.gov/vents/marianas/NWRota-2010-CruiseReport.pdf). Embley, R.W., Baker, E.T., Chadwick, Jr., W.W., Lupton, J.E., Resing, J.A., Massoth, G.J., and Nakamura, K., 2004, Explorations of Mariana Arc volcanoes reveal new hydrothermal systems: EOS-Transactions of the American Geophysical Union, v. 85, no. 4, p. 37 and 40. Information Contacts: William W. Chadwick, Oregon State University and NOAA Vents Program, Newport, Oregon; 2115 SE OSU Drive, Newport, OR 97365 USA (URL: http://nwrota2009.blogspot.com/). The research vessel Thomas G. Thompson conducted a survey of the Mariana Arc in the Commonwealth of the Northern Mariana Islands from 9 February to 5 March 2003 (Embley and others, 2004). That survey identified a number of hydrothermal systems (plumes) on the arc volcanoes. One volcano, detected in 2003 and named "NW Rota 1," was revisited in 2004 and again found to be actively venting (figure 1). That submarine volcano sits ~ 64 km NW of the island of Rota, with its summit at 14°36.048'N, 144°46.519'E (14.601°N, 144.775°E). Another volcano visited in 2003-2004 was an apparently quiet, non-erupting caldera lacking eruptive age constraints called "West Rota" (discussed at the end of this report). Most of the information gleaned from the 2004 cruise remains preliminary, coming from scientists still at sea. Figure 1. A map showing part of the Northern Mariana Islands and vicinity (an area roughly midway between the main island of New Guinea on the S, and Tokyo, Japan on the N). The islands shown include Guam, Rota, Saipan, and others. The map emphasizes the location of the active submarine volcano NW Rota 1 and the currently quiet submarine caldera West Rota. After Embley and others, 2004; courtesy of the American Geophysical Union. The ship towed a conductivity-temperature-depth (CTD)/rosette system to map and sample hydrothermal plumes over NW Rota 1. The 2003 tow data detected a vigorous, 200-m-thick layer of hydrothermal plumes above the volcano's summit. Chemical analysis of the 2003 plumes found high concentrations of particulate aluminum, sulfur, iron, and manganese, along with elevated 3He, a helium isotope considered diagnostic of a magmatic source and associated hydrothermal discharge. The active crater's summit depth was ~ 517 m.
[During 27 March-18 April 2004], the RV Thompson revisited the Mariana Arc and found NW Rota 1 still vigorously active. William Chadwick and Robert Embley, National Oceanographic and Atmospheric Agency (NOAA), members of the cruise scientific staff, notified GVN that some video images from NW Rota 1 were taken with a ship-deployed remote vehicle (ROPOS-Remotely Operated Platform for Ocean Science). Videos posted on their web page showed views of the so-called "Brimstone Pit" (figures 2 and 3). Brimstone Pit represents a S-flank vent at a depth of 555 m, a spot ~ 40 m below the summit in rocky terrain. The videos and photos showed ash and sulfur bursts from the crater and a vent whose rim was covered with spatter (but probably not from this specific event). Water samples taken in a plume rising from the vent had temperatures of 30°C. Although incompletely mapped, the vent was roughly 20 m across and elliptical in outline; in the vertical dimension the vent appeared ~ 12 m deep and funnel-shaped. Figure 2. Bathymetry of NW Rota 1 showing the location of Brimstone Pit, [March 2004]. Courtesy of Bob Embley, NOAA. Figure 3. At NW Rota 1, the 555-m-deep submarine crater called Brimstone Pit discharged a dense, yellowish, particle-laden plume. This [30 March] 2004 photo was taken from a remote submarine vehicle, which captured the plume from the submarine vantage point, a relatively rare circumstance for shallow-depth submarine eruptions. At other times during the exploration, venting slowed or ceased, allowing views of the vent itself. Courtesy of W. Chadwick, NOAA. During the ROPOS dive, the activity at the crater was variable. At the beginning of the dive there was only a wispy plume escaping, allowing the observers to see into the crater. Later in the dive, the crater returned to pulsing activity with bigger, more vigorous plumes and small rocks raining down on the crater rim. Over the summit, which was still at a depth of ~ 517 m below sea level (as it was in 2003), the ROPOS images depicted a lot of diffuse venting of clear fluids. Intense geyser-like discharges flowed from the vents with jets rising to several ten's of meters. Cloudy water rose to form a plume several hundred meters above the summit. The pulsating jets carried sand- to gravel-size particles (a few centimeters across), ejecta that rained down on the crater rim out to a distance of ~ 10 m. Droplets of molten sulfur in the jets gave a yellowish cast to the billowing clouds, suggesting a temperature of at least 100°C (figure 3). The ROPOS came up from the last dive covered in sand and gravel, and in sulfur droplets, which had solidified and adhered to the submersible's body! In overview, the [30-31 March 2004] dives with ROPOS documented NW Rota 1 in a magmatic phase of activity. The active vent showed time-varying behavior that included precipitation of sulfur droplets from the venting fluids, pulses of ejecta from the vent, and large amounts of fresh, glassy ejecta surrounding the crater. In addition, the study identified a turbid plume extending ~ 0.7-2.0 km from the volcano, reflecting an intensity unseen in 2003, and presumably the result of the vigorous summit activity. The large amount of sulfur was believed to be forming by interaction of magmatic SO2 with water to form elemental sulfur and sulfurous acids. Bob Embley suggested that this magmatic event was in the early stages, as evidenced by negligible alteration of glassy lavas in spite of incredibly corrosive hot fluids. Team biologists noted that biota had only begun to colonize the impacted area. Volcanic seismicity may accompany this event, although its detection may require a network of near-source ocean-bottom seismometers. At least from initial looks at their data, geophysicists at the NOAA Vents Program failed to detect any T-phase hydroacoustic signals coming from this vicinity. It should be noted, however, that their real-time hydrophones are located in the NE Pacific at a great distance from the volcano. In an effort to enlist other seismic and acoustical instruments, Olivier Hyvernaud (Laboratoire de Détection et de Géophysique, CEA/DASE/LDG; with access to the French Polynesian network), and Roderick Stewart (CTBTO, the Preparatory Commission for the comprehensive nuclear-test-ban treaty, with access to Juan Fernandez island data) have been contacted. Thus far it appears that their systems lacked signals clearly attributable to NW Rota 1. West Rota. During early April 2004 the RV Thompson also visited another newly identified submarine volcano that the 2003 survey group named "West Rota" (~ 56 km W of the island of Rota). It appeared inactive, and lacked a strong hydrothermal plume in the waters above it. However, it contained features indicative of a violent explosive eruption at some unknown time in the (geologically) recent past; namely, felsic volcanic rocks and the formation of a big caldera. The West Rota caldera is comparable in size to Crater Lake, Oregon (figure 4). The cruise scientists suspect that this volcano erupted violently a few thousand, to ten's of thousands, of years ago. Figure 4. Although the erupting submarine volcano NW Rota 1 sits ~ 64 km NW of the island of Rota; slightly more to the W of Rota lies the recently identified and apparently quiet submarine caldera named West Rota. West Rota is elongate in the NW-SE direction and bears approximate size resemblance to the scenic lake-filled, 10-km-diameter caldera in the Cascade range of Oregon (USA), Crater Lake. West Rota's caldera floor lies at ~ 1.6 km depth below sea level. Courtesy of NOAA. References. Embley, R.W., Baker, E.T., Chadwick, Jr., W.W., Lupton, J.E., Resing, J.A., Massoth, G.J., and Nakamura, K., 2004, Explorations of Mariana Arc volcanoes reveal new hydrothermal systems: EOS-Transactions of the American Geophysical Union, v. 85, no. 4, p. 37 and 40. Information Contacts: William W. Chadwick, Jr., Cooperative Institute for Marine Resources Studies (CIMRS), NOAA Pacific Marine Environmental Laboratory (PMEL), 2115 SE OSU Drive, Newport, OR 97365 USA; Robert W. Embley, NOAA Pacific Marine Environmental Laboratory (PMEL), 2115 SE OSU Drive, Newport, OR 97365 USA (URL: http://oceanexplorer.noaa.gov/explorations/04fire/welcome.html); Douglas Wiens, Department of Earth and Planetary Sciences, Washington University, Campus Box 1169, One Brookings Drive, Saint Louis, MO 63130-4899, USA (URL: http://epsc.wustl.edu/seismology/). During 18 April-13 May 2006, scientists from the National Oceanic and Atmospheric Agency (NOAA) and Oregon State University completed the 2006 Submarine Ring of Fire Expedition aboard the research vessel Melville. This expedition was the third in a series of explorations of the submarine volcanoes lying along the Mariana intra-ocean volcanic arc. That arc extends from S of the island of Guam northward more than 1,450 km through the Commonwealth of the Northern Mariana Islands (see map in above report on Daikoku). A previous expedition to Northwest Rota-1 in 2004 discovered and named this volcano and found it erupting (BGVN 29:03). Daily logs of the 2006 expedition, including photographs and video clips, can be viewed on the NOAA Ocean Explorer web site noted below, from which much of this report was taken. 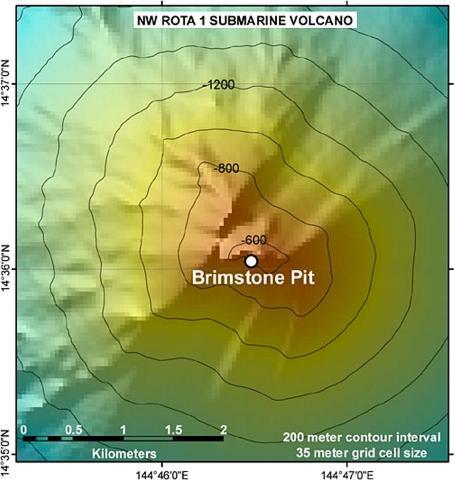 On 23 and 24 April 2006, the unmanned (remotely operated vessel, ROV) submersible Jason 2 revisited Brimstone Pit, a spot on the volcano where an ash-and-gas plume was discovered in 2004 and observed again in 2005 (Embley and others, 2004 and 2006). The changes were striking. According to Robert Embley (Oregon State University press release, 25 May 2006), "we saw features of submarine volcanic activity never before directly observed, including explosions of lava from a crater accompanied by a red glow and voluminous volcanic gases and ejected rocks." A degassing event at Brimstone Pit began releasing bubbles that formed a growing submarine plume cloud. The Pit, at a depth of 560 m, was significantly deeper (by ~ 20 m) than it was in the previous visits and there appeared to have been a recent collapse of the summit area. The Pit exuded a sluggish pulsating cloud of white color along with some gas bubbles. Some time later, the pit was almost filled with the white cloud, which appeared to come from the lavas themselves. The observers concluded that they witnessed lava extruding on the seafloor. Particle plumes were mapped using a light-scattering sensor (LSS), part of the CTD (conductivity-temperature-depth) instrument package towed over the summit and flanks of the volcano. The CTD revealed layers of turbid (cloudy) water extending as far as 8 km down the S flank, and to depths up to 2,900 m. The turbid layers may arise from periodic collapse of the unstable slopes of volcanic fallout material similar to that found in the white cloud observed at the summit. Submersible dives on 25 April 2006 to the Brimstone Pit revealed a lava flow forming there. The initial approach to the Pit revealed a line of bubbles (mainly CO2) escaping from a fracture in the underlying rock. However, in place of the previously flat ground that described the Pit on 24 April, a small ash cone had formed. It was ~ 6 m in diameter with walls about 1 m high, made up entirely of fine-grained ash. As the submersible approached, observers saw a plume discharging out of the cone's center and, on closer inspection, it appeared that ash was raining out of the bottom of the plume and falling onto the flanks of the small cone. Near Brimstone Pit, the submersible collected a piece of newly erupted andesite lava containing elemental sulfur filling vesicles. The lava flow advanced but slowly, traveling forward bit by bit, chunk by chunk. As the lava advanced, the flow's toe vigorously degassed. The emitted gas and the associated plume took on a yellow hue. Scientists interpreted the escaping gases as mainly sulfur-rich (SO2 and H2S), which can mix with and make the surrounding seawater strongly acidic and precipitate elemental sulfur, the source of the plume's yellow hue. Liquid native sulfur inside the plume was seen raining on the seafloor as small droplets and filled in the numerous holes in the lava where the gases escaped. Locally, carbon dioxide formed bubbles in front of the advancing lava. These different gases provided the force behind the vigorous 'mini-explosions' within the lava flow. Finishing the last of six dives at Northwest Rota-1 on 29 April 2006, and combining observations from the two previous expeditions, scientists developed some conclusions about processes at this extremely dynamic site. Prior to arrival in 2006, a major landslide must have originated near Brimstone Pit. During the first day of 2006 submersible observations, a turbid layer generated by the slide surrounded the lower flanks. The next day, when the water had cleared, half of Brimstone Pit had fallen away and the seafloor around the vent was swept clean of recent lava. Over the next week, eruptive activity gradually increased in intensity and vigor. By the end of the week, a 5-m-high cone made of ash and lava blocks had built up over the vent, and the turbid layer on the flanks was almost gone. On the last dive, scientists saw glowing lava jetting from the vent (figure 5). Figure 5. Glowing red lava jetting out of the vent at Northwest Rota-1 Brimstone Pit at depth of 560 m. Photo taken from the submersible Jason II, 29 April 2006. Image courtesy of Submarine Ring of Fire 2006 Exploration, NOAA Vents Program. The scientists concluded that observing explosive volcanic activity at a submarine volcano was easier and more revealing in many ways than on land, perhaps because the eruptive activity, although violent at times, is usually limited to a small area due to the dampening effect of the surrounding water (figure 6). For example, at Brimstone Pit the pressure of 560 m of water over the site reduced the power of the explosive bursts. Also, the water quickly slows down the rocks and ash violently thrown out of the vent. The scientists viewed the release of volcanic gases from the erupting lava with new clarity, with the help of the streams of bubbles and multicolored plumes as they were emitted. In addition, the scientists recorded the activity using a portable underwater microphone (hydrophone). Figure 6. Eruption at Brimstone Pit in Northwest Rota-1 at a depth of 560 m. Photo taken by the submersible Jason II, 29 April 2006. Image courtesy of Submarine Ring of Fire 2006 Exploration, NOAA Vents Program. Chadwick and his associates at NOAA have identified and named 56 seamounts in the Mariana Arc, 11 of which show hydrothermal activity, based primarily on CTD instrument tows (table 1; see figure 5 for map showing locations). Table 1. Seamounts in the Mariana arc that are active volcanos based on submersible observations and/or that registered signs of hydrothermal activity on CTD tows. Brief comments on noteworthy observations from several of those visited in 2006 are included. Courtesy of William Chadwick, NOAA, June 2006. E. Diamante 127 m 145.6583°E 15.9167°N Active, metal-rich, ephemeral 'black smokers' shallowest yet discovered. Daikoku 323 m 144.1942°E 21.3242°N See report in this issue. Nikko 392 m 142.3255°E 23.0784°N Sulfur chimneys, boiling pots of molten sulfur surrounded by a thin crust on a larger lava lake. References. Embley, R.W., Baker, E.T., Chadwick, W.W., Jr., Lipton, J.E., Resing, J.A., Massoth, G.J., and Nakamura, K., 2004, Explorations of Mariana Arc volcanoes reveal new hydrothermal systems: EOS, Transactions, American Geophysical Union, v. 85, no. 2, p. 37, 40. Embley, R.W., Chadwick, W.W., Jr, Baker, E.T., Butterfield, D.A., Resing, J.A., de Ronde, C. E.J., Tunnicliffe, V., Lupton, J.E., Juniper, S.K., Rubin, K.H., Stern, R.J., Lebon, G.T., Nakamura, K., Merle, S.G., Hein, J.R., Wiens, D.A., and Tamura, Y., 2006, Long-term eruptive activity at a submarine arc volcano: Nature, v. 441, no. 7092, p. 494-497. Oregon State University, 25 May 2006, Press Release: Nature paper details eruption activity at submarine volcano: College of Oceanic and Atmospheric Science (COAS), 104 COAS Admininstration Building, Corvallis, OR 97331. Information Contacts: William W. Chadwick, Jr., Cooperative Institute for Marine Resources Studies (CIMRS), NOAA Pacific Marine Environmental Laboratory (PMEL), 2115 SE OSU Drive, Newport, OR 97365 USA; NOAA Ocean Explorer (URL: http://oceanexplorer.noaa.gov/explorations/06fire/welcome.html). During an April 2006 expedition (BGVN 31:05), scientists from the National Oceanic and Atmospheric Agency (NOAA) and Oregon State University aboard the research vessel Melville witnessed the volcano ejecting lava, bombs, and sulfur-rich (SO2 and H2S) plumes. This is the first site where explosive submarine eruptions have been directly observed from a submersible (see Videos, below). According to William Chadwick, a brief visit to NW Rota-1 was made on 24 February 2008. With support from the NOAA Ocean Exploration Program and the U.S. Coast Guard, the scientists deployed a hydrophone and plume sensor. While on site, scientists found that the volcano was still erupting. There were no instruments left after the April 2006 visit, so the observational record was discontinuous. On the other hand, scientists visited the site four times in four years and consistently found that it was active. Moreover, Chadwick and colleagues had collected multibeam bathymetry in 2003 and 2006 (Walker and others, in press). Depth changes between those surveys were up to +40 m and extended from the eruptive vent at 550 m directly downslope to at least 2,000 m. They were consistent with volcaniclastic deposits from ongoing eruptions. The suggestion is that NW Rota-1 has been very active, if not continuously active. On 24 February 2008 the Melville crew made a vertical cast over the eruptive vent with a light-scattering sensor and detected an eruption plume below 500 m depth. Hydrophone data also indicated eruptions with cyclic bursts about once a minute. These appear very similar to the explosions observed by ROV and hydrophone in 2006 (Chadwick and others, 2008). The explosion sounds were louder and more frequent in 2008 than in 2006. During the 2008 visit, explosion signals filled the 24-hour acoustic record. Before departure, the crew installed a hydrophone and plume sensor to record activity over the next year. Resing and others (2007) described two types of venting at NW Rota-1. The first was a focused plume rich in Al, S, Si, CO2, Fe, Mn, and 3He. The second was a plume with diffuse flow, rich in Fe, Mn, CO2, and 3He, but without Al, S, and Si. Data suggested that the pH of these plumes were less than 1.0, primarily due to SO2 and possibly HCl. The authors claimed that the volcano is producing some of the greatest chemical anomalies ever observed in non-buoyant hydrothermal plumes and greatly different from that observed in any other hydrothermal setting. Videos. Eruption videos taken from an unmanned submersible on 29 April 2006 can be found at http://www.oceanexplorer.noaa.gov/explorations/06fire/logs/april29/april29.html website. The five videos are titled as follows: (1) The extremely dynamic Brimstone Pit, (2) Brimstone Pit erupting with glowing red lava jetting out of the vent, (3) Brimstone Pit erupting with glowing red lava and gas bubbles, (4) Brimstone Pit sulfur plume envelopes the Jason ROV [remotely operated vehicle], and (5) The pulse and shake of the Brimstone Pit during another eruption. References. Chadwick, W.W., Jr., Cashman, K.V., Embley, R.W., Matsumoto, H., Dziak, R.P., de Ronde, C.E.J., Lau, T.-K., Deardorff, N., and Merle, S.G., 2008, Direct video and hydrophone observations of submarine explosive eruptions at NW Rota-1 volcano, Mariana Arc: J. Geophys. Res.-Solid Earth, doi:10.1029/2007JB005215 (in press). Resing, J.A., Lebon, G., Baker, E.T., Lupton, J.E., Embley, R.W., Massoth, G.J., Chadwick, Jr., W.W., and de Ronde, C.E.J., 2007, Venting of acid-sulfate fluids in a high-sulfidation setting at NW Rota-1 submarine volcano on the Mariana Arc: Economic Geology, v. 102, no. 6, p. 1047-1061. Walker, S.L., Baker, E.T., Chadwick, Jr., W.W., Resing, J.A., Lebon, G.T., Lupton, J.E., and Merle S.G., (in press), Eruption-fed particle plumes and volcaniclastic deposits at a submarine volcano: NW-Rota-1, Mariana Arc: J. Geophys. Res. Information Contacts: William Chadwick and Robert Dziak, Oregon State University and NOAA Vents Program, Newport, Oregon; 2115 SE OSU Drive, Newport, OR 97365 USA (URL: http://oceanexplorer.noaa.gov/explorations/06fire/welcome.html). An oceanographic research expedition during 3-17 April 2009 visited NW Rota-1 submarine volcano, located about 100 km N of Guam in the Mariana arc. Scientists visited the volcano with research ressel Thomas G. Thompson, making dives with the Jason remotely operated vehicle (ROV). The volcano was erupting almost all of the time with varying amplitude. 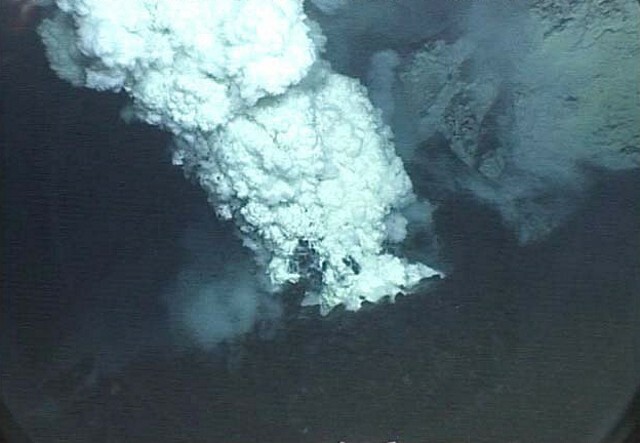 This volcano was previously observed erupting during ROV dives in March 2004 (BGVN 29:03) and April 2006 (BGVN 31:05) on National Oceanographic and Atmospheric Agency (NOAA) Ocean Exploration expeditions, and by the Japanese in October 2005 and February 2008 (<BGVN 32:02). A hydrophone deployed from February 2008 until February 2009, operated under the direction of Robert Dziak, measured almost continuous signals from the volcano during the 1-year period. This hydrophone will record data for another year, but it lacks telemetry, so NOAA intends to retrieve its data in 6-12 months. Prior to the deployment of the hydrophone activity was observed using a ROV only during brief visits. On the expedition blog, William Chadwick noted that with NW Rota-1 apparently nearly continuously active since at least 2003, the volcano can provide a natural laboratory for learning about underwater eruptions, how submarine volcanoes grow, and how they affect the ocean environment. Scientists are able to get close to the eruptive vent because the pressure of the ocean above keeps the energy of the eruptions subdued, allowing them to gain a view of what is happening in the vent. For example, scientists watched lava slowly being pushed up and out of the eruptive vent while the sea floor shuddered and quaked and huge blocks were bulldozed out of the way to make room for new lava emerging from the vent. The volcano had grown considerably since 2006, producing a new cone ~ 40 m high and ~ 300 m wide. Despite the ongoing eruption, with ash and rocks falling everywhere and an extreme chemical environment, a thriving ecosystem was present. The population of animals and microbes had both increased relative to 2006 and become more diverse, including new species not yet found elsewhere. At the end of the 2009 cruise, an array of instruments (hydrophone and chemical sensors) was left to monitor events over the next year. Moorings on the flanks will look for landslides and debris flows. Chadwick's group plans to return in 2010 to continue investigations. On his blog site are some video highlights from the 2009 expedition showing activity at the Brimstone eruptive vent at the top of the new cone. Information Contacts: William W. Chadwick, Oregon State University and NOAA Vents Program, Newport, Oregon; 2115 SE OSU Drive, Newport, OR 97365 USA (URL: http://nwrota2009.blogspot.com/); Robert G. Dziak, Oregon State University and NOAA Vents Program, Newport, Oregon; 2115 SE OSU Drive, Newport, OR 97365 USA. A submarine volcano detected during a 2003 NOAA bathymetric survey of the Mariana Island arc was found to be hydrothermally active and named NW Rota-1. The basaltic to basaltic-andesite seamount rises to within 517 m of the sea surface SW of Esmeralda Bank and lies 64 km NW of Rota Island and about 100 km north of Guam. 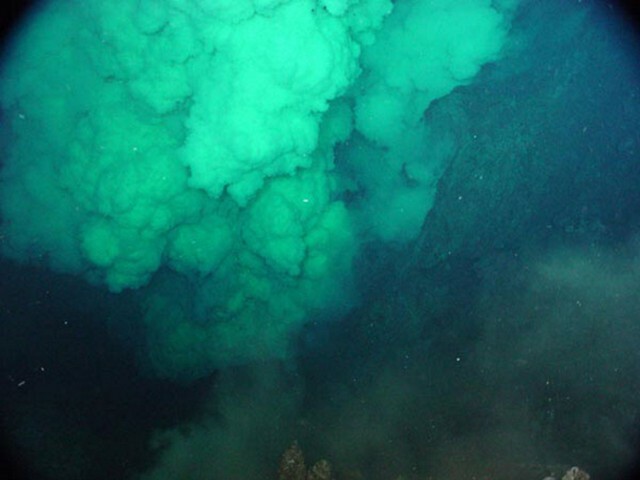 When Northwest Rota-1 was revisited in 2004, a minor submarine eruption from a vent named Brimstone Pit on the upper south flank about 40 m below the summit intermittently ejected a plume several hundred meters high containing ash, rock particles, and molten sulfur droplets that adhered to the surface of the remotely operated submersible vehicle. The active vent was funnel-shaped, about 20 m wide and 12 m deep. NW Rota-1 is a large submarine volcano with prominent structural lineaments about a kilometer apart cutting across the summit of the edifice and down the NE and SW flanks. Embley R W, Baker E T, Chadwick W W Jr, Lupton J E, Resing J A, Massoth G J, Nakamura K, 2004. Explorations of Mariana Arc volcanoes reveal new hydrothermal systems. Eos, Trans Amer Geophys Union, 85: 37 and 40. Embley R W, Chadwick W W Jr, Baker E T, Butterfield D A, Resing J A, de Ronde C E J, Tunnicliffe V, Lupton J E, Juniper S K, Rubin K H, Stern R J, Lebon G T, Nakamura K, Merle S G, Hein J R, Wiens D A, Tamura Y, 2006. Long-term eruptive activity at a submarine arc volcano. Nature, 441: 494-497. NOAA Vents Program, 2004. Submarine ring of fire 2004, Mariana arc submarine volcanoes, R/V Thomas G. Thompson Cruise TN167, March 27 - April 17. NOAA Vents Program final cruise report (http://oceanexplorer.noaa.gov/explorations/04fire/logs/summary/media/marianas2004cruisereport.pdf). There is no Deformation History data available for NW Rota-1. There is no Emissions History data available for NW Rota-1. This hydrothermally active submarine volcano at the southern part of the Mariana arc was first detected during a 2003 NOAA bathymetric survey and was named NW Rota 1. The seamount rises to within 517 m of the sea surface about 100 km north of Guam. When the volcano was revisited in 2004, a minor submarine eruption was occurring from the vent named Brimstone Pit. Prominent structural lineaments about a kilometer apart can be seen cutting across the summit of the edifice and down the NE and SW flanks. Image courtesy of Susan Merle (Oregon State University/NOAA Vents Program). A dense, particle-laden plume rises above a vent named Brimstone Pit in this March 30, 2004 photo taken from a remote submarine vehicle during a NOAA bathymetric survey of the Mariana arc. The vent intermittently ejected a plume several hundred m high containing ash, rock particles, and molten sulfur droplets that adhered to the surface of the remotely operated submersible vehicle. At other times during the exploration, venting slowed or ceased, allowing views of the vent itself, which was funnel-shaped, about 20 m wide and 12 m deep. NOAA image, 2004 (courtesy of Bill Chadwick; http://oceanexplorer.noaa.gov/explorations/04fire/logs/march30/march30.html). An explosive eruption plume rises from a submarine vent on NW-Rota 1 volcano on April 27, 2006. This submarine volcano was first detected during a 2003 NOAA bathymetric survey of the Mariana Island arc. The basaltic to basaltic-andesite seamount rises to within 517 m of the sea surface SW of Esmeralda Bank. During subsequent visits in 2005, 2006, and 2008, the volcano was seen to be in eruption. Courtesy of Bill Chadwick, 2006 (Oregon State University/NOAA). The Global Volcanism Program has no maps available for NW Rota-1. There are no samples for NW Rota-1 in the Smithsonian's NMNH Department of Mineral Sciences Rock and Ore collection. Large Eruptions of NW Rota-1 Information about large Quaternary eruptions (VEI >= 4) is cataloged in the Large Magnitude Explosive Volcanic Eruptions (LaMEVE) database of the Volcano Global Risk Identification and Analysis Project (VOGRIPA).